Tribes has been sending travellers to Uganda since 1998 and we know it really well. We appreciate feedback from our clients whether it’s good or bad (thankfully it’s nearly always excellent!). We publish all the reviews we receive on our website. Below a some of the ‘Overall Comment’ from our travellers who’ve completed the feedback for us. We hope this helps you get a better view of whether to trust us with your holiday. Please click on the names for the full review from that client. We’d love to hear from you if you would like our help to plan a trip to Uganda. "We had high expectations of the experiences that were possible during our holiday. All were as good or exceeded our expectations. " "This was an absolute thrill of a trip and one every wildlife enthusiast should be aware of! The gorilla trekking was challenging but once we were with the gorillas it surpassed our expectations! " "A great itinerary. 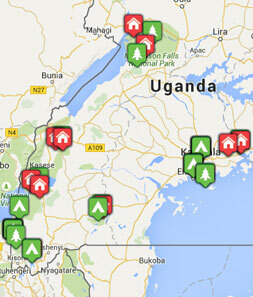 We would advise the getting the drive to Bwindi out of the way early. This gets the hard, rough roads out of the way, and also after all the good food I'm not sure I would be fit enough to trek gorillas. The one regret is that we didn't have the time to include a trip to Kidepo (apparently the best NP)"
"The trip experience from the time of making the booking , arrangements and the actual trip itself has been excellent. Everything works to perfection and precision to ensure a great trip." "First class in every respect. Arrangements, quality of accomodation and food."